Kane Realty Corporation and ULTra PRT announced the start of a feasibility study to bring PRT (Personal Rapid Transit) to Midtown Raleigh. “We have always envisioned rapid transit of some sort at North Hills. Such transit is a natural evolution of the continued growth of North Hills, where people are looking for an efficient way to move around without continually moving their car”, John Kane, CEO and Chairman of Kane Realty Corporation announced today. North Hills was designed to be both pedestrian and vehicle friendly, yet the current growth on the eastern side of Six Forks and likely future expansion toward Duke Raleigh Hospital and Wake Forest Road lengthens the area to walk. “We all like to walk in urban areas, but at some point, the consumer wants to know that there are other ways to move about, rain or shine, as this area continues to grow”, John Kane continued. Developer John Kane was a recent Heathrow ULTra passenger: “I think it’s a game changer. It’s really fun. More people will want to live here, play here, and stay here, with a safe and easy way to move around. We can enhance current transit.” Retailer Jill Peters likes the idea of easing congestion and bringing in more customers, “It would be really good.” The 90 second news clip highlights shops, hotels, and pedestrians in the leading-edge North Hills activity center. Kane Realty Corporation is a recognized leader in innovation with the transformation of the North Hills area. From the movie theater sitting directly on top of a Target store (with an escalator for shopping carts) to the two-story Harris Teeter grocery store, North Hills is being showcased throughout the country as an example of how best to maximize land use. “Kane Realty Corp. is clearly a leader in making innovation a reality. North Hills is one of the finest examples of pushing the envelope on successful smart-growth, high density, mixed-use”, announced Nick Ford, President of Sales, ULTra PRT. ULTra PRT, makers of the ULTra system, has visited the Triangle several times in the past year as the area continues to explore transit options. “Transit economics for North Hills are promising because the density generates demand for many internal trips within the property,” continued Nick Ford in articulating why North Hills is ideal for the Triangle’s first enhanced transit system. 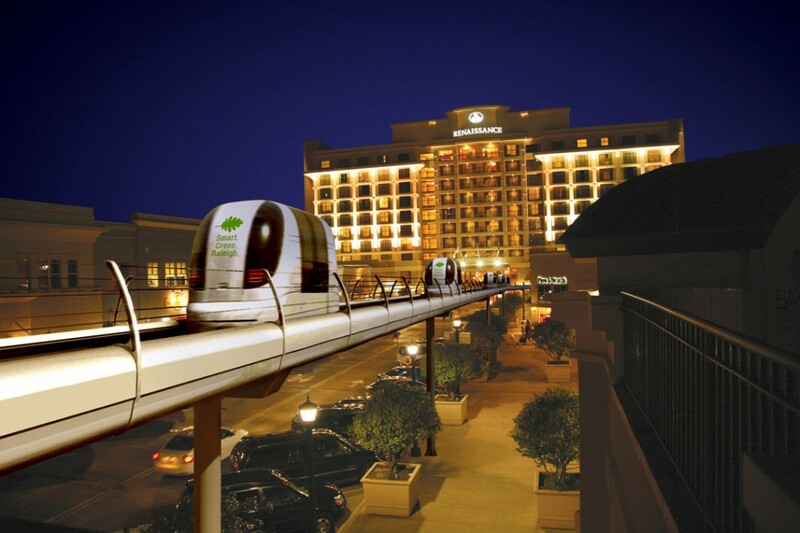 ULTra is an electric battery driven, elevated transit system with 4 person vehicles. 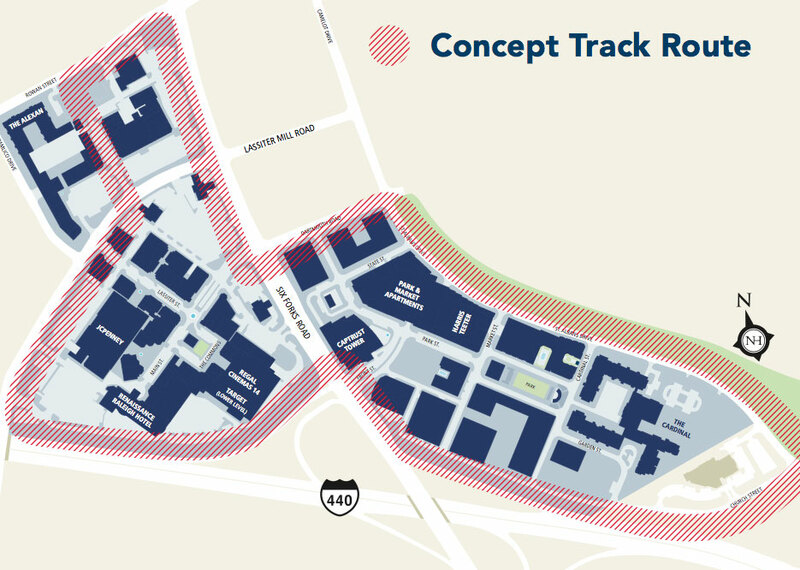 PRT would connect all North Hills areas so residents, workers, visitors, and shoppers can easily move from one place to another. Users will be able to take individual electric cars on demand, point-to-point to the station of their choice. PRT provides the freedom to leave the car behind, connecting pedestrians throughout the North Hills district. PRT also increases the effectiveness of transit and carpooling by solving the “last mile problem,” to connect from the transit stop to the final destination.